Cleaning & Disinfecting Solution to the next level. CLEAR CARE PLUS Cleaning & Disinfecting Solution has the same amazing cleaning power of CLEAR CARE®, but is formulated with exclusive HydraGlyde® Moisture Matrix technology. That’s how your lenses stay hydrated and feel loved. CLEAR CARE PLUS Solution cleans and disinfects like no standard multi-purpose solution. In fact, CLEAR CARE PLUS has been proven to give you cleaner-feeling lenses, better overall lens comfort and more hours of comfortable lens wear versus multi-purpose solutions. That’s because CLEAR CARE PLUS Solution deep cleans your lenses with the power of peroxide, then neutralizes into a gentle saline solution - much like your own tears - but without the chemical preservatives found in other solutions. You can even see it working! 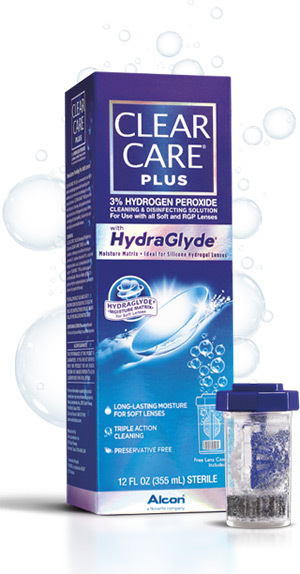 Not only does CLEAR CARE® PLUS Solution clean and disinfect your contact lenses with the bubbling power of hydrogen peroxide, it also surrounds your lenses with long-lasting moisture. Clean and comfortable lenses? You got it.